There is an opinion that it does not matter for an office computer, which processor, how much memory, and what other components are installed, as it will mostly run Microsoft Office. This is not true, of course. You can neglect performance in a computer that runs only MS Word and email client only to a certain degree. Otherwise, a seemingly easy spellcheck will 'suddenly' slow down to a crawl, and archiving a mail database will take forever. By the way, this is typical not only of the so-called 'nettops' (computers with processors weak even for notebooks, to say nothing of desktops). It also concerns full-size PCs with 4-5-year-old single-core processors. One can get used to anything, of course, and use it (even nettops with Atom processors) in one's work. But if we speak of a new computer, you'd better consider at least cheap Low-End representatives of modern processors for desktop PCs. If you regularly use graphics and multimedia applications, it makes sense to raise performance a bit higher. Because work time of employees is more expensive than saved power consumption. In actual practice there may be no difference: modern desktop processors consume several dozens of Watts in office computers running a text editor (without monitor consumption). However, unlike gaming PCs, office configurations are chosen with the help of universal benchmarks. It takes too much efforts to create your own set of tests that would imitate environment of each user. Besides, this decision should be usually made quickly. In practice, the most adequate tests for office hardware these days are SYSMark 2007 and PCMark Vantage. We decided to collect results obtained in these benchmarks in PC configurations with different processors, graphics cards, and memory size. And we traditionally add an interactive designer to our article. HDD: 250 GB Seagate Barracuda 7200.11 SATA, 7200 rpm. SYSMark 2007 Preview (three test runs with a calibration run, which results are not taken into account). It looks like these tests depend primarily on CPU performance, graphics cards are of little importance here. Results are also affected by the size and speed of memory (in our tests we used 2 x 1-GB DDR2-1066 AENEON for all processors, except for Sempron and Celeron, which were tested with 2 x 512MB DDR2-800 Kingston to match their budget nature). And finally, pay attention to one more PC component - hard drive. Its performance also contributes to the total score (so we have to use identical drives for correct comparisons). Note that the benchmark includes old program versions, so it may show conservative attitude to multi-core processors. Additional cores will most likely increase the total score only insignificantly, so a CPU with fewer cores operating at a higher frequency may be at advantage. 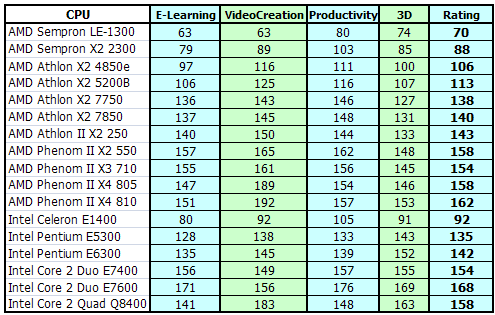 This table illustrates the lack of effect from the installed graphics card on test results. The total score and results of separate tests practically don't differ between the integrated AMD 780V chipset and two graphics cards based on Radeon HD3450 and HD4350. The layout of CPU forces complies with the theory: indeed, the only single-core processor (Sempron LE-1300) in our contenders is apparently outperformed, but dual-core processors are outscored by CPUs with more cores only in video processing tests. Nevertheless, newer versions of these applications use additional cores more actively, so Phenom II X3 710 will be an interesting choice, being relatively inexpensive and demonstrating balanced average results, which may improve in future. The most intense competition occurs within 135-145 points - this performance level is provided by Athlon X2 7000 and Pentium E processors. The new processor Athlon II X2 250 looks well in this class as well. To all appearances, maximum performance of office software for the money falls on this range. And finally, powerful dual-core processors (Phenom II X2 550 and Core 2 Duo E7600) score maximum points, performing on a par and sometimes even leaving Phenom II X4 800 and Core 2 Quad Q8400 behind. However, the X4 810 is not much slower than the E7600, but the Q8400 is a complete failure. This processor is in a higher class (price and positioning). For example, it may be in the same class with Phenom II 920/940. But it's difficult to say how adequately SYSMark 2007 benchmarks processors of such a level. We'd rather admit that quad-core processors are not justified for an average office PC, which usually doesn't run the latest software (just as SYSMark 2007).